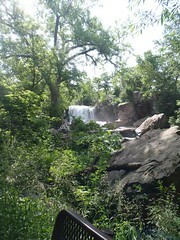 The Circle Trail at the Pipestone National Monument was not exactly a circle, as the Ranger informed us that the bridge by the waterfall was currently closed. We still decided to do the trail, as it was paved, so thus you would think a totally wheelchair accessible trail and the Ranger gave us the impression it was. Well, it is not and it is not really a safe Circle Trail for wheelchair users. The park's website sort of tells you this, but not specifically enough to explain what happened to Mik and gives enough hope that we certainly still would have done the trail and it still would have happened. 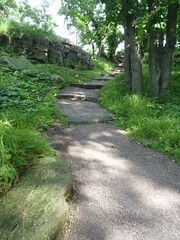 Near where you get to the waterfall there is a path that splits off and has steps. Obviously, we did not even try this path, but Dad went off on it and Mik and I decided to keep going towards the waterfall. Well, we did not get too far. A little past the bench near where the path splits there is an extremely tilted part of the path. It did not look like a problem, but as soon as I was on it Mik's left big wheel left the ground and there was no way I could keep it from flipping over. At least Mik knew to bail his iPad (case did its job and protected iPad) and put his hands down in front of him and his only injury was a bunch of mosquito bites because there were swarms of them by the waterfall and he would have gotten those anyways probably. Mik feels there should be a warning sign on the trail right there (not to mention the website's warning should be posted near the trail or at least the ranger should have said something) and he would never go past the bench on the trail in a wheelchair. Very slight possibility if you stick to half on the sane and go around on the far right you would not tilt too much, but the river is right below you and that sand patch is all that kept Mik from going down, so he does not recommend any sort of testing going through that part of the path with a wheelchair. The trail is still worth doing before you get to that point, as you can even see the waterfall from a distance right before the dangerous part of the path. Just be prepared for swarms of mosquitos!!! 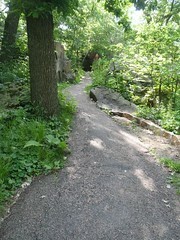 It is mainly a nature hike, but there were a few Pipestone quarries along the path. During our visit, though, they were mostly flooded in all the way. awesome work i get from you.By following this post disable people are become delightful to survive new life as human. I read full post very carefully that gives me extra energy to survive my disabled life as a new human .